National Tribune. Gettysburg. Reminiscences of the Great Fight by a Participant . Edward C. Culp. 25th O.V.I. 19 March, 1885. Thanks to Ed Keen for submitting this source. 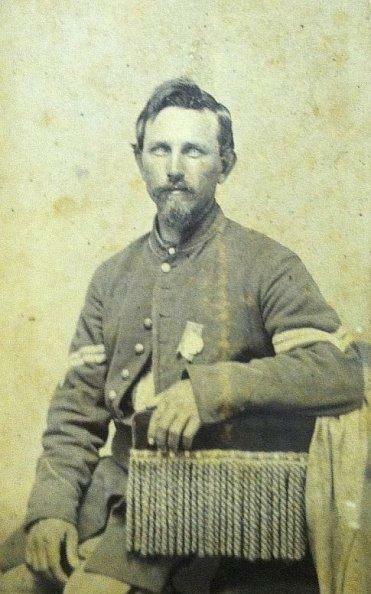 Lt. Col. Nathaniel Haughton, 25th Ohio Volunteers . Editors. Ohio Civil War Genealogy Journal. pg. 179. Volume I. Number 4. Winter. 1997. Ohio Genealogical Society. Mansfield. Ohio . Thomas J. Janney Papers . Thomas J. Janney. Lt. Co. K & I. 25th OVI. 16 items. Letters, papers, muster out roll and 2 letters from Lt. Joseph H. Potts. Co. F. 75th OVI in Libby Prison. Call# VFM1598. Ohio Historical Society. Columbus. Ohio. Organized June 28th, 1861, under Colonel James A. Jones, it served in West Virginia until April, 1862, when it crossed the Alleghanies and fought at Bull Pasture Mountain and Cross Keys, losing over 100 men. It joined Pope's campaign and was at the second Bull Run battle; again at Chancellorsville and Gettysburg, sustaining heavy losses. The Regiment re-enlisted January 1st, 1864 and soon after proceeded to the South Carolina coasts, where it operated until the fall of Charleston. The 25th marched into that city February 26th, 1865, and continued in service in South Carolina long after the close of the war. It was mustered out June 18th, 1866, having served over five years. wearing his Ohio Service Medal. 25th Regiment Infantry. Organized at Camp Chase, Columbus, Ohio, and mustered in June 28, 1861. Ordered to West Virginia July 29, and duty along the Baltimore & Ohio Railroad from Grafton to the Ohio River, till August 21. Attached to Cheat Mountain, District West Virginia, to November, 1861. Milroy's Command, Cheat Mountain, District West Virginia, to April, 1862. Milroy's Brigade, Dept. of the Mountains, to June, 1862. 2nd Brigade, 1st Division, 1st Corps, Army of Virginia, to September, 1862. 2nd Brigade, 1st Division, 11th Army Corps, Army of the Potomac, to August, 1863. 2nd Brigade, Gordon's Division, Folly Island, S.C., 10th Army Corps, Dept. of the South, to January, 1864. District of Hilton Head, S.C., 10th Army Corps, Dept. of the South, to April, 1864. District of Hilton Head, S.C., Dept. of the South, to October, 1864. 3rd Separate Brigade, Dept. of the South, to November, 1864. 1st Brigade, Coast Division, Dept. of the South, to February, 1865. 3rd Separate Brigade, Hilton Head, S. C, Dept. of the South, to March, 1865. 1st Separate Brigade, District of Charleston, S.C., Dept. of the South, to August, 1865. 4th Separate Brigade, District of Western South Carolina, Dept. of the South, to January, 1866. Dept. of the South to June, 1866. SERVICE.--Moved to Cheat Mountain Summit, W. Va., August 21, 1861, and duty there August 25-November 25. Operations on Cheat Mountain September 11-17. Action at Cheat Mountain September 12. Greenbrier River October 3-4. Duty at Huttonsville November 25, 1861, to February 27, 1862. Expedition to Camp Baldwin December 11-13, 1861. Action at Camp Allegheny, Buffalo Mountain, December 12. Expedition to Huntersville December 31, 1861, to January 6, 1862. Duty at Beverly, Cheat Mountain, March. Expedition on the Seneca April 1-12. Action at Monterey April 12. At Staunton till May 7. Battle of McDowell May 8. March from Franklin to Strasburg May 26-June 10, pursuing Jackson up the Shenandoah Valley. Battle of Cross Keys June 8. Duty at Sperryville and Centreville, Va., till August. Battle of Cedar Mountain August 9. Pope's Campaign in Northern Virginia August 16-September 2. Freeman's Ford August 22. Battle of Bull Run August 29-30. Duty in the Defences of Washington, D.C., till December. Expedition from Centreville to Bristoe September 25-28. March to Fredericksburg, Va., December 10-16. "Mud March" January 20-24, 1863. At Brook's Station till April 27. Chancellorsville Campaign April 27-May 6. Battle of Chancellorsville May 1-5. Gettysburg (Pa.) Campaign June 11-July 22. Battle of Gettysburg, Pa., July 1-3. Pursuit of Lee, to Manassas Gap, Va., July 5-24. At Warrenton Junction July 25-August 6. Moved to Folly Island, S. C., Dept. of the South, August 6-12. Duty at Folly and Morris Islands, S.C., operating against Fort Sumpter and Charleston till January, 1864. Duty at Hilton Head, S. C., till November 23, 1864. (Veterans absent on furlough January to March, 1864. Cos. "A," "G" and "I" at Fort Pulaski, Ga., September 25 to October 23.) Expedition against Charleston & Savannah Railroad November 28-30. Battle of Honey Hill November 30. Coosaw River December 4. Demonstration on Charleston & Savannah Railroad December 6-9. Deveaux's Neck December 6. Occupation of Charleston February 26, 1865. Expedition toward Santee River February 28-March 10. Camp at Mt. Pleasant March 12-April 3. Potter's Expedition to Camden, S.C., April 5-25. Dingle's Mills April 9. Statesburg April 15. Occupation of Camden April 17. Boykins' Mills April 18. Denkins' Mills and Beach Creek near Statesburg April 19. Return to Mt. Pleasant April 28, thence moved to Charleston May 6 and to Columbia May 7, and garrison duty there till May 25. Duty in Fairfield, Newberry, Edgefield, Lexington and Richland Counties till April, 1866. At Summerville till May and duty on the Sea Islands till June. Ordered to Todd's Barracks, Ohio, June 6. Mustered out June 18, 1866. Regiment lost during service 7 Officers and 151 Enlisted men killed and mortally wounded and 3 Officers and 119 Enlisted men by disease. Total 280.